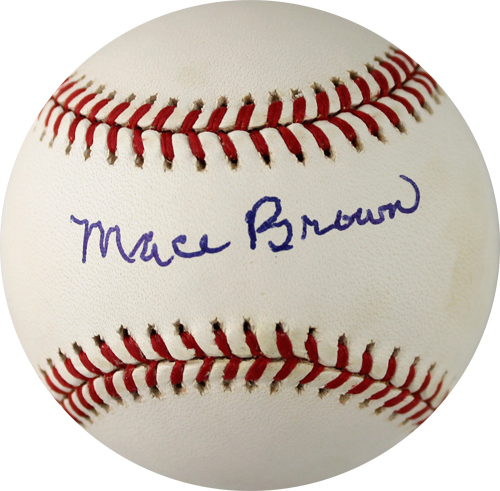 Mace Brown personally hand signed these official National League baseballs. Each autographed baseball includes authentication from TRISTAR. Mace Brown was a relief pitcher for the Pittsburgh Pirates, Brooklyn Dodgers and Boston Red Sox. The 1938 All-Star was the first reliever to play in an All-Star game. While pitching for the Red Sox in 1943, he led the AL in games pitched with 49. He compiled a 76-57 career record. After retiring, he stayed with the Red Sox organization as a coach and scout from 1947 through 1989. Brown passed away in 2002 at the age of 92.